This past week, my husband and I vacationed in Tacoma, Washington to celebrate his birthday and to enjoy some cooler weather. The rain gods were kind enough to take their own vacation, for we arrived after a rainstorm and had beautiful sunny days during our whole trip. The challenge of photographing while vacationing with a spouse is balancing the need to enjoy the moment with the need to spend lots of time taking dozens of pictures of the same thing without upsetting said spouse. So I’ve learned over the past few months to only take enough shots before my husband gets impatient, which means I don’t have much to share with you. But I can tell you about the interesting places we visited. One of those places is the Museum of Flight in Seattle. It’s a short drive south of the Seattle airport. When you arrive, you start on the outside where there is both a vintage Air Force One and a Concorde that you can walk through. Next, you go into the museum and enter a large glass hall filled with aircraft from different eras. Off to the side is the relocated and refurbished red barn that housed the original Boeing Company. You can walk through it and learn about the history of the company William Boeing founded. Other areas of the museum cover space aircraft and personal aircraft. And there are lots of flight simulators throughout the museum. Finally, there’s an air traffic control tower exhibit that you can experience. If you enjoy planes or history, I highly recommend. And lastly, the docents are mostly ex-pilots and ex-military personnel, and they love telling you stories and answering questions. I’ll be posting a few more photos from our trip over the next few days. This little guy landed on my hand while I was in a parking lot. I guess he needed a rest. This image is a good example of the quality of close-up shots made on an iPhone 5S. In good light, it’s awesome. Sometimes, symmetrical design soothes my artistic sensibilities. When I photographed this shot, the canna plants were too far away, and they were backlit. The photo did not come out well. 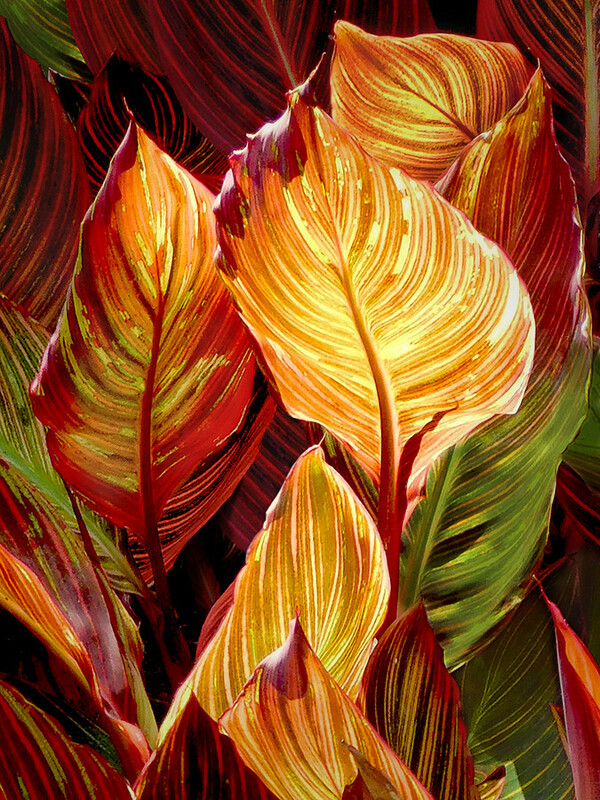 But I loved the canna’s color and lines so much, so I decided to do a photo art study instead (and I noted to take some better shots of these plants another time). I apologize for not posting for awhile. I had to work two weekends ago. And last weekend, I was feeling exhausted. I guess it caught up with me. It’s interesting how uncreative I can be when I’m tired. Creative work of any kind requires exploration and decision-making. If I have no energy, I can’t do those things. I mentioned this to an artistic friend of mine, and she advised me to pay attention to my energy level. She reminded me to get enough sleep, eat right, walk around, and be social. Very simple, isn’t it? Now why didn’t I think of that?